AMMONNEWS - Protesters in various governorates in the kingdom blocked vital roads on Wednesday in protest of the government's decision to lift subsidies on oil derivatives and cooking gas. Protests and riots renewed after a tense night on Tuesday following the government's decision to liberalize fuel prices, which automatically led to a hikes in prices of gasoline, kerosene, diesel, and cooking gas. Major roads blockaded include al Hissa international highway connecting Amman with the southern governorates, before security forces intervened to re-open it. In Shobak, angry protesters blocked the tourism road, and gave public employees in the municipality building "10-minutes" to vacate the building and impose civil disobedience and a strike from work. In Amman, a road in Na'our was blocked after riots erupted near the Development circle, and another road near the local police station in the area. In Irbid, hundreds of protesters assembled at Wasfi al-Tal circle there and chanted angry slogans at the government. 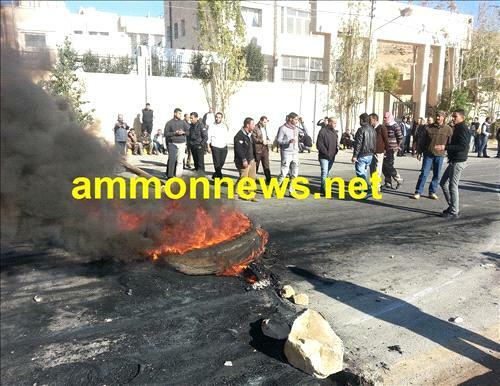 Protesters also placed burning rubber tires at the main highway linking Zarqa and Amman. Clashes erupted in Dhiban in Madaba governorate between residents and gendarmerie forces, who had to use tear gas to disperse crowds that attacked a police station and torched 3 police vehicles and hurled rocks at the station. In northern town of Kufr Asad, a major road was blocked by protesters. A demonstration erupted in the southern governorate of Tafileh Wednesday afternoon, and also in Ma'an, Zarqaa, and Rubba. JORDAN HAVE BEEN ROBED,THERE IS A PRINCIPLE IN QUANTUM MECHANIC ( NO REALITY EXIST OUTSIDE PERCEPTION )SO PERCEPTION CONSTITUTE REALITY , I HAVE BEEN IN US 30SOME YRS I AM NOT IN Jordan, BUT JORDAN IS IN ME, AND I CARE . I DID WHAT IS CALLED IN SCIENCE , (CROSS SECTION STATISTIC) , I ASKED 81 PEOPLE WHO STOLE THE WEALTH OF JORDAN ,ALL BUT ONE GAVE ME THE SAME NAMES MOSTLY ARE INTRINSIC PART OF THE ROYAL PALACE , SO THE SOLUTION IS OBVIOUS . PROSECUTING ALL THE THIEF'S, DUE PROCESS OF LAW , IT NEVER GONNA HAPPENED UNFORTUNATELY, I AM WELLING, READY AND ABLE TO RITE A LONG ARTICLE WRITE THERE NAMES AND THE PROSECUTING EVIDENCE , BUT I AM SURE NO PAPER WOULD PUPLISH THE ARTICLES , FEAR OF BEING SHUT DOWN. ( IF SUCH ARE THE PRIEST GOD BLESS THE CONGREGATION ) ONLY THE TRUTH SITS YOU FREE BUT IT MAKES YOU ANGRY 1ST .